Genetics is flourishing to an extent that those of us who have been around for a long time can hardly believe. The proliferation of journals is daunting: each issue of some, such as Genetics, resembles the proverbial Manhattan phone book. And we're now seeing the proliferation of online journals, which seems to be totally out of control in a competitive gold rush. It's not just primary journals, all purportedly peer reviewed, that are proliferating. Review journals are sprouting like dandelions (Sense About Science, a British charitable trust dedicated to correcting misrepresentations about science, estimates that 1.3 million peer reviewed articles are published a year, and growing.) Pretty soon we'll have journals that just report the contents of review journals. In addition, we see the journals two times or more. Approved manuscripts are posted online before the final actual paper. Then the paper is e-published online before ink is put to any actual paper. Our inboxes are being filled with Urgent! emails listing stunningly important new papers. Humility is not part of the mix! 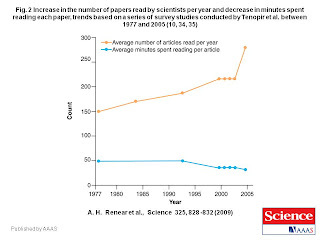 Indeed, a recent pape r in Science (Strategic Reading, Ontologies, and the future of Scientific Publishing, Renear and Palmer, Science 325:828-833) shows that we read more but it takes us less time than in the past--as depicted in the graph. And soon computers will be mining papers for us, extracting the pithy parts, so that we can read even less. Does anybody really believe we have much recall of all this even now? Hasty reading, reading mainly to cite something later in a 'literature review' of one's own papers or grant proposals. Peer review is clearly more hasty than ever before, and those of us on editorial boards know that a substantial fraction who are asked to review a paper decline. This is out of control but clearly serves many interests. Not the least is that we're each trying to make our mark on tenure committees, grant reviewers--and posterity. Now. Patience is not called for! Of course, as always, most of what's being published will be chaff and relatively little grain, or weeds among the thousands of flowers that are blooming. This does not necessarily mean that the papers being published are poor papers. Whether the system is good or bad depends on many factors and probably differs for each person depending on their age, seniority, grant funding, and personality. Some naturally are happy buried in minutiae, focused on one particular problem, such as the genetics of some specific disease, or a specific protein. But others of us are not at ease with the current system, not just because we grew into our profession in calmer times, but because we think the important long-term aspect of science is synthesis, rather than reductionist partitioning and division down to the smallest detail. Since its 'invention' in the 17th and 18th centuries, science has become a search for generalizations, not just particulars. Its long-term flow is driven by synthesis, which we often call 'theory'. In a field with thousands of technical particulars there is a kind of stream-like momentum. Implicitly, at least, people follow each other in terms of methods and kinds of analysis. Frantically trying to keep up or get ahead or stay afloat, de facto consensus forms--genomewide association studies, e.g., will explain complex diseases, so everyone jumps on the bandwagon. Epigenetics. Copy number variation. Whatever is the latest hot new thing, until something new comes along. Is this good in the long run, or is it ephemeral and herd-like? The answer is probably a bit of both. Human genetics, plant genetics, Drosophila or mouse or zebrafish or nematode genetics are all providing similar explanations for how genes work and how development happens. Microbiology, though single-celled, is similar. In that sense, we really do get an overall picture of how life is from a genetic point of view. At the same time, until there is a manifest feeling of failure or barrier, the flow won't shift and the de facto consensus can become a theory that is accepted without necessarily being very critically examined. We write a lot about the issues we think are being short-changed or mis-stated in this process. It is probably true that most people are happily ensconced in the details of their chosen subject and don't care about the big picture--we accept the current synthetic view without thinking too hard about it. That takes time or may slow down our next publication! But we're satisfied that the sea of particulars represents dramatic progress and are happy to carry breathlessly along. We may drain ourselves to the point of exhaustion this way, or this may be how progress is made--it is our descendants who, a century from now, in calmer times, or at least in retrospect, will have the vantage point from which to look back and see what we have wrought. Our pointillist sea may, upon the distance of time, be a coherent picture after all. Well, our post today seems prescient! This afternoon, the Genetics Society of America sent around a notice to subscribers that as of January 2010 its journal, Genetics, will be published online only. Paper, color, and mailing costs have combined with reduced individual paper-subscribers to make this happen. Benefits will include no color page-charges to authors, and the ability to embed hyperlinks in the text. One can surmise that the number of articles will increase. For some of us, scanning Tables of Contents is more comfortably done from paper, or we have so many journals to scan that it is too easy just to forget to do it and delete the Urgent! emailings we referred to in the post. For many, this is the new online world to which they are accommodated. Whether it's good or bad or a mix, it's a sign of the times. One can predict a cascade (or stampede?) of other journals to go this Way of All Flesh in the coming year or so.